There is currently just the 1 ferry route running between Graciosa and Faial operated by 1 ferry company – Atlanticoline. The Vila da Praia to Horta ferry crossing operates weekly with a scheduled sailing duration from about 4 hours 45 minutes. Whilst we’ve taken great care to ensure the information on this page is correct, as the frequency and duration of crossings on all routes can vary from time to time we’d advise that you get a live quote for current availability on this Graciosa Faial crossing between Vila da Praia and Horta. Graciosa is the northernmost island of the Central Group in the Azores archipelago, an autonomous region of Portugal in the North Atlantic. 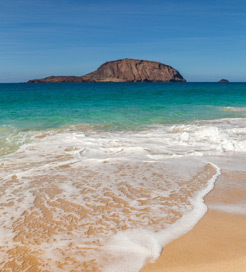 With a landscape dominated by clay and whitewashed houses, Graciosa is known locally as ‘the white island’. Offering the perfect scenery for a relaxing getaway, it’s dotted with historic buildings, traditional windmills and picturesque vineyards. 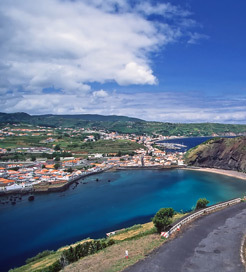 It also has the most rural feel of the Azorean islands. As well as being a great location for hiking, diving and fishing, Graciosa boasts natural hot springs in Carapacho to the south, where you can soak in 40°C water renowned for its healing properties. From the town of Praia on the east coast, you can choose from a wide range of sailings to most islands in the Azores, making Graciosa a good departure point for exploring this idyllic archipelago.